This color. Need I say more? 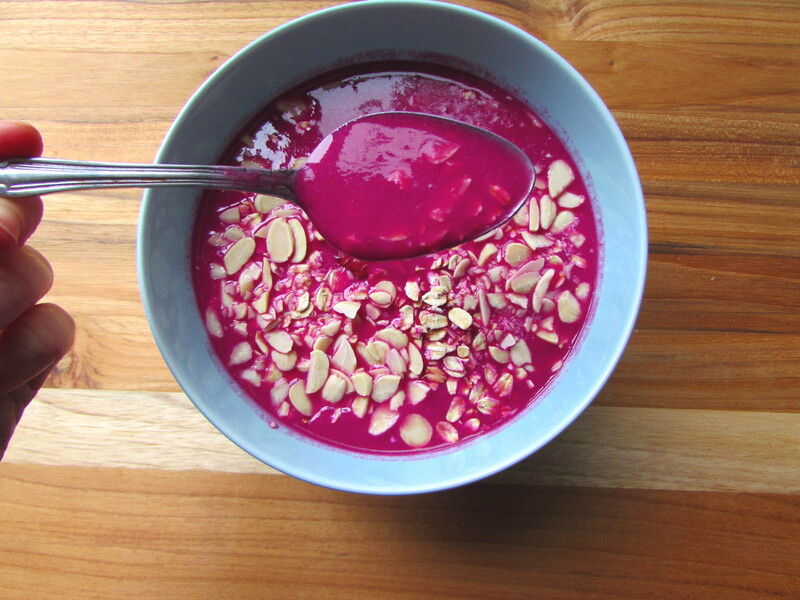 In my Valentine’s Day recipe series, beets have played a primary role. Entranced by their ability to saturate dishes with their emotion-tugging, almost fluorescent hue, I have gone back to them again and again. 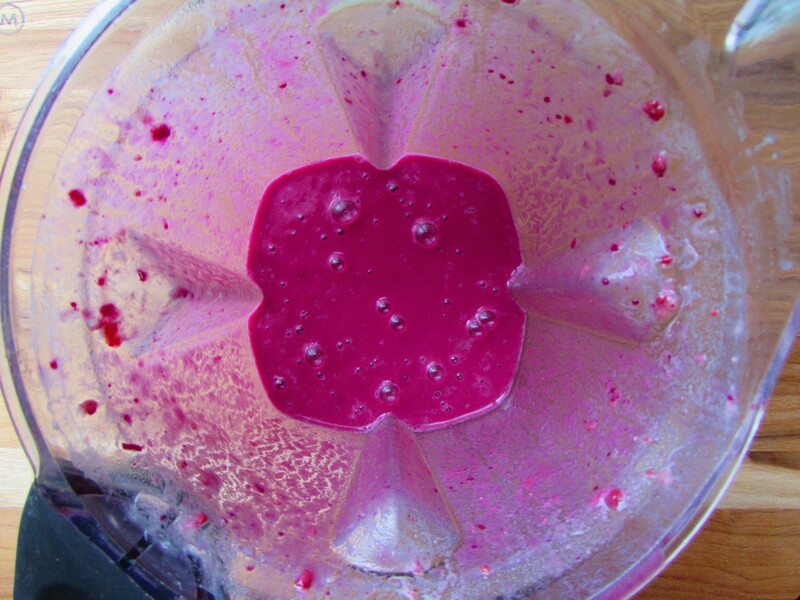 Thinking of beets within a smoothie, you may wrinkle your nose. 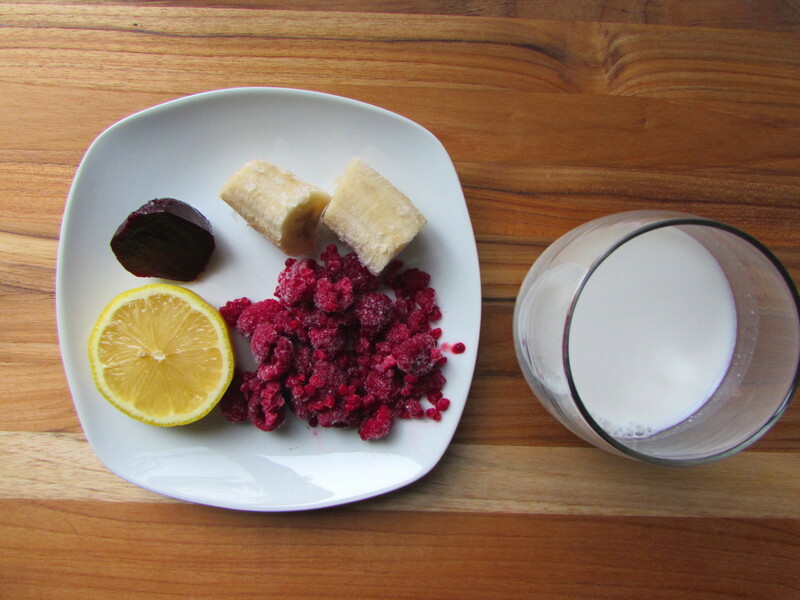 I know, pureed beets for breakfast doesn’t exactly sound like the most appetizing way to start the day. 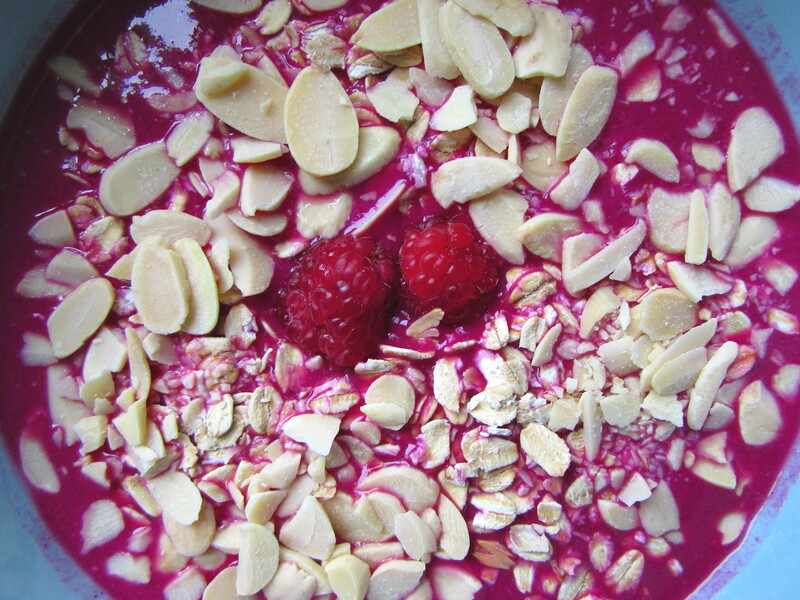 What may surprise you is that there is only a very small bit (maybe 1.5 inches) of beet in this tremendously pink bowl. The remainder of the ingredients are all smoothie regulars: raspberries, banana, non-dairy milk (homemade hemp milk), lemon juice, and some unpictured vanilla protein powder (Sunwarrior, but of course). 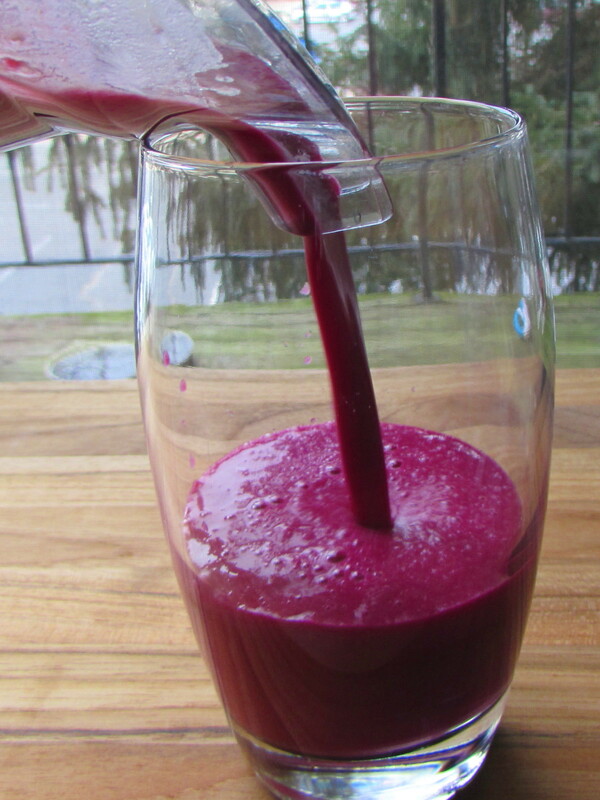 You can enjoy this smoothie in a glass, like most traditional smoothie-drinkers. I am a toppings monster. I love the contrast of crunchy nuts, cereal, and buckwheat / oats on my smoothies, along with the salty, mouth-coating fattiness of nut butter dollops. Usually, I add a giant blob of nut butter to my bowls, but since I used chopped almonds here, I skipped that. 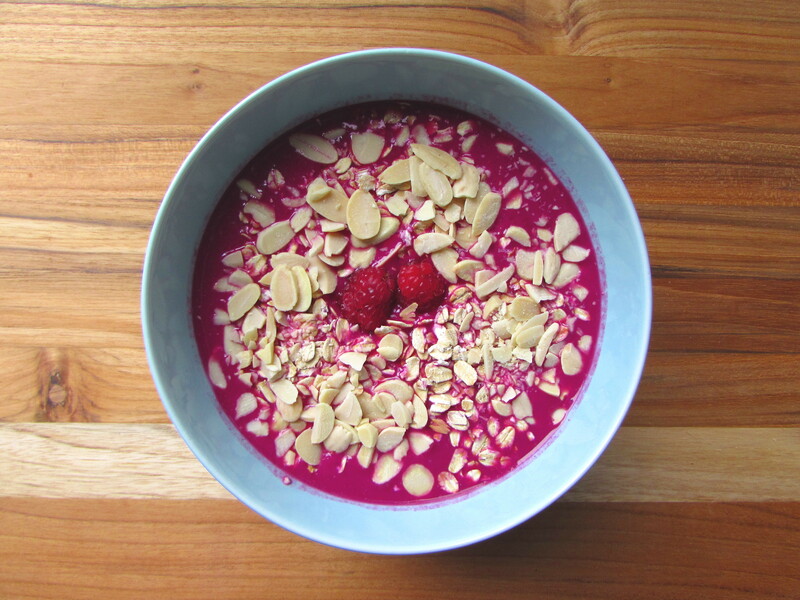 Eating a smoothie with a spoon allows you to savor the smoothie, and consume it with mindfulness and moderation. If you give me a smoothie in a glass, you’ll likely turn your back to put down the blender, and then look back only to see that I have already finished the entire glass. And then all the time and effort put into making a delicious smoothie has all but been extinguished after a mere 20-second chug. Anyone else have that problem? 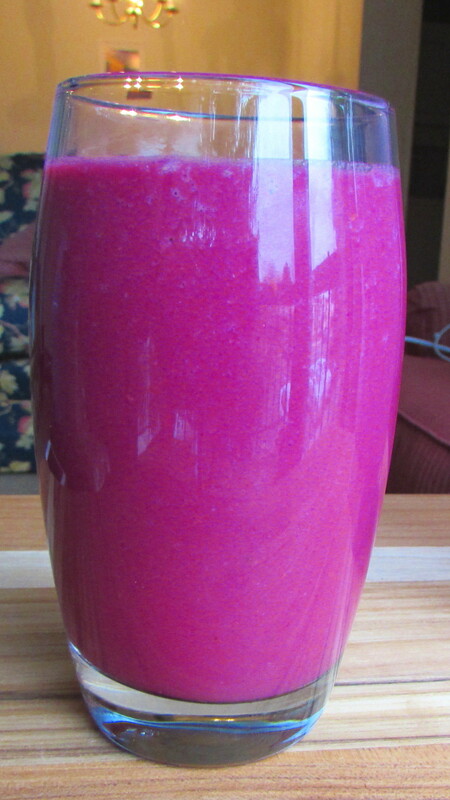 Anywho, friends, whether in bowl or glass, I hope you take my Sweetheart Smoothie for a whirl. It would be an invigorating way to start your Valentine’s Day, whether on its own, or perhaps accompanied by some heart-shaped pancakes. Place all ingredients into blender in the order listed. 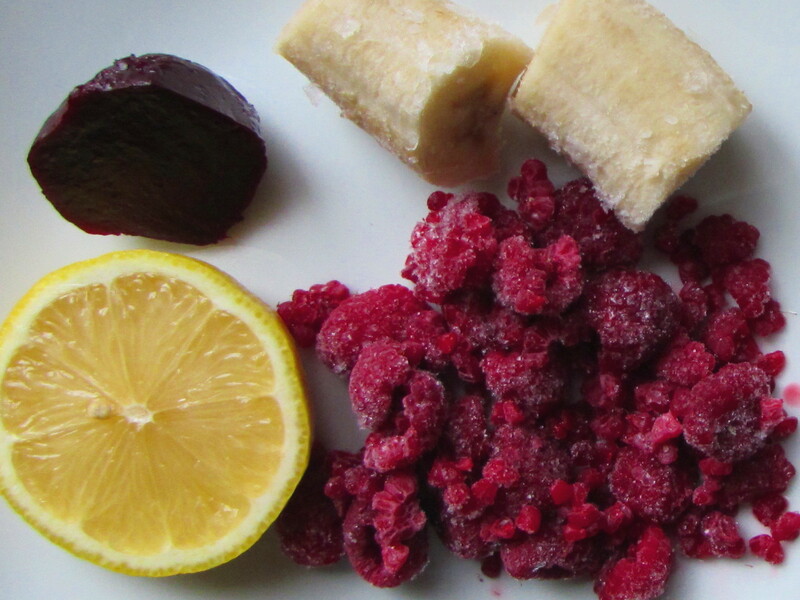 Blend until smooth, with no ice chunks. Pour into a glass, or into a bowl and add desired toppings. Enjoy! Notes: 1) I used 1/2 cup hemp milk + 1/2 cup water because I didn’t want too creamy of a smoothie, but if you do, use 1 cup non-dairy milk and no water. Or, you can also use 1 cup water and no non-dairy milk for the opposite effect. 2) I used Sunwarrior Vanilla protein powder, which is relatively sweet. If your protein powder is not very sweet, or completely unsweetened, you may have to add agave, maple syrup or stevia to taste. How does the hemp milk come liquid or powder? Where is it in the grocery store? I make the hemp milk at home by blending up 1/4 cup hemp seeds with 4 cups water in my blender until smooth. Alternatively, you may be able to find hemp milk in a shelf-stable box near the other non-dairy shelf-stable boxes at the grocery store. In Stop and Shop, these are in a Natural Foods aisle. Yup… you said it. THIS COLOR!! Gorgeous.